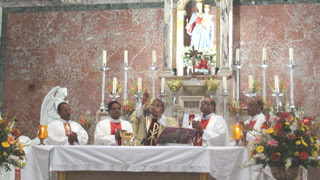 MATUNGA, NOVEMBER 1, 2011: "This celebration of God's faithfulness must stimulate the quality of our own fidelity to the Covenant that God made with us both as individuals and as a Province." These words summed up the mood of the jubilarians: Fr. Tony D'Souza, Fr. Nelson Falcao, Fr. Alexander Fernandes, Fr. Dominic Lisboa, Fr. Blany Pinto, Fr. Ignas Macwan, Fr. Edison Fernandes and Fr. Edwin Colaco. Fr. 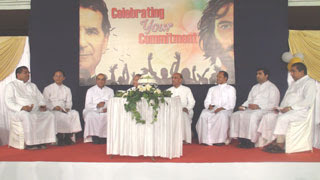 Ashley Miranda, in his toast, reiterated that the theme 'Celebrate Your Commitment' was an occasion for the Province of Mumbai to rejoice with the jubilarians because God had used them to spread the magic of Don Bosco, the faithfulness of Mary and the love of Jesus in blessing the lives of many (especially the young) to whom they had ministered to with zeal and commitment. Fr. Michael Fernandes, Provincial of the Mumbai Province, while presenting a citation to each jubilarian sketched their many qualities. He stated thus: 'In Fr. Blany Pinto, one notices the dedication to pastoral ministry and his formative skills in building communities and apostolic groups. In Fr. Edwin Colaco, is reflected the youth minister who uses creativity to enthuse and empower youth. As a Province, we thank them for their examples of fidelity and let us sincerely believe in the Lord's faithfulness who assures us with the words: "I shall be with you till the end of time.